Vidcon returned this past weekend for its eighth year running to the Anaheim Convention Center. To sum up VidCon in one line, this expo represents all things in “new media” and anything related to it. As an attendee put it, new media means anything not NBC, ABC, CBS, FOX, or anything on mainstream television. If it has to do with the realm of online video and the next generation of technology, it had a place at VidCon. The convention itself mainly held dozens of vendor booths representing gadgets, shows, software, and activities. Beyond the booths, a handful of “internet celebrities” made an appearance here to cater to their fans. If thinking about the traditional definition of celebrity, no actual celebrity made an appearance here. However, plenty of children and teenagers idolize famous YouTube and Instagram people, and some of these famous internet personalities fall into the category of internet celebrities. This also paints an illusory veil of a personality’s true fame, as people measure fame directly with amount of followers/subscribers. This goes without saying that this primarily attracted countless teenage girls to this event. Take one good look around the convention and you would see mostly teenage girls in attendance. While I understand their fascination with meeting their cherished internet celebrities, I do not understand spending at least $150 to attend this event without a guarantee of meeting any of the so-called internet celebrities. VidCon did not used to cost that much, but I guess their increasing fame plus the fact that they sold out every prior year merited the increase in admission. Oh, and some people may have heard on social media about drama at VidCon this year. 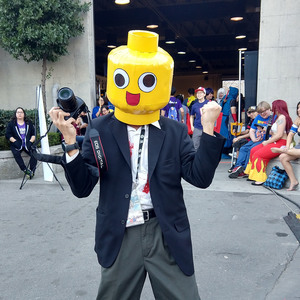 Some of the drama started with rowdy and/or self-entitled people trying to raise a scene at the con, such as self-entitled people who think they have more fame than their follower count would say, or gamers trying to troll other attendees. As some would say, if you have haters, you have succeeded. The night market trend continues to gain popularity, as it exponentially attracts more and more visitors with each passing event. Derivating from populated Asian countries, a night market represents a food & entertainment festival packed with many different types of food, vendors, and various forms of entertainment, including live performances and games. In the past few years, night markets have spread globally due to the increased desire for Asian food, one of which has landed in Koreatown just west of Downtown Los Angeles. This past weekend, the folks over at the Ktown Night Market hosted their annual event at Robert F. Kennedy Community Schools in Koreatown. This weekend-long all-ages festival brought the nightlife of the east to the west, and showed the locals what goes on at night in populated Asian cities. Admission only cost $5 per person, while guests had to pay for everything else once inside. As an event with “Food Fest” in the name, visitors could expect to discover tons of authentic and interesting foods here. While most of the food found here derived from Korea, visitors could find cuisine from other regions of Asia, such as Chinese, Thai, Vietnamese, Japanese, and more. The organizers did not categorize any sections of the street – visitors could encounter food, merchandise, food trucks, games, and more all scattered throughout the area. The 9th Annual Global Reddit Meetup Day took place this past Saturday. The Los Angeles region met up at Grand Park in Downtown LA, with an afternoon filled with food and games. This free and all-ages event invited Reddit users to come mix and mingle to meet new friends and share ideas and fun. Operating like a potluck, many of the attendees brought snacks and treats, while some others brought things to do, such as games, piñatas, and sporting goods such as balls and frisbees. While stereotypes of Reddit users revolve around shut-ins who stay on their computers and/or smartphones, this event proved otherwise. In fact, no one ever truly witnessed anyone else buried away on their smartphone. Virtually all of the attendees had a good time meeting others and chatting the day away. Many others felt the same way – during my walk towards the location, I encountered a few others looking for the event, and they too had their skepticism about the types of people that we would encounter. Fortunately, everyone exhibited a friendly vibe, and I felt sad to leave so soon because I had 2-hour parking only and wanted to stay longer. For more information about this meetup event, check out the Los Angeles section of Reddit for recent posts. Check out that page from time to time for updates from around LA County, as well as information about future events and meetups. This past Saturday, the Crossing Foursquare Church in Whittier held their inaugural car show for the eleventh year in a row. Free to attend for all ages, this small display of classic cars took over the street and parking lot of this local church, allowing people to freely walk around and gaze upon the classic works of art. In addition to all the cars, local vendors set up to sell food, apparel, trinkets, accessories, car parts, and more. Car enthusiasts would love events like this, despite its small size for a car show. This event made for a great followup to the Uptown Whittier Car Show that takes place annually in early June. If you like cars, remember to check out the Cross Foursquare Church next year, and bookmark early June the Uptown Whittier Car Show, also free to attend for all ages. The 39th Annual Taste Of Greece returns this upcoming weekend to St. Paul’s Greek Orthodox Church in Irvine. At this all-ages fair, visitors will find a multitude of Greek foods & desserts, wine, beer, ouzo, vendors, music, and more to keep everyone entertained throughout the weekend. Complete with merchandise, food, dessert, drinks, music, dance, rides, exhibits, and more, this annual fair brings a wealth of things for you, your friends, and your family to enjoy and make a lasting memory out of. Any visitor can participate in the dancing going on under the main tent, or just hang out and enjoy the sights. Some may choose to enjoy the eats of Greek culture with some Greek BBQ Pork, Loukanico, Saganaki, Galaktoboureko, and Baklava. Support this local Greek Fair by following them on Facebook. When the Greek have an occasion to celebrate, they will celebrate hard, as demonstrated whenever a Greek festival takes place.